Continuing from last weeks episode, this one sees the Doctor talking to the camera about Beethoven and the Bootstrap Paradox/Casual Loop and then picks up his guitar to play the Doctor Who theme tune. 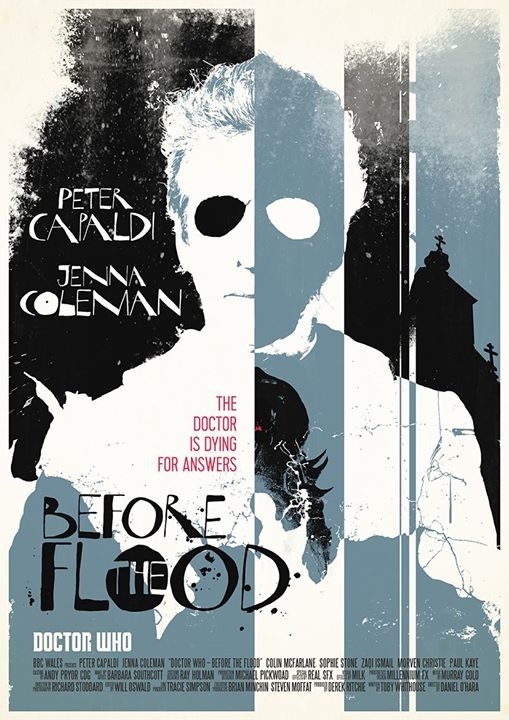 After the titles we find the Doctor and his two companions in Scotland in the village before it flooded where he finds the first Ghost before he was a Ghost who turns out to be an undertaker called Prentis with a body to bury called the Fisher King. He rushes back to the future to leave Clara a message only to find out he is a Ghost there and accepts his fate, distressing Clara greatly. Meanwhile, back in the past the undertaker named Prentis finds his dead body is not dead. Back in the Future the Doctor’s Ghost relays two messages to Clara and her companions whilst setting the other ghosts free. He tells her to run. Back in the past the Fisher King is loose and taking lives and the Doctor lets it happen to save Clara. He tries to go back in time but the Tardis won’t let him as it would mean crossing his own timeline. Clara figures something out herself for one of the crew has not been infected by the alien lettering. The Doctor decides to face the Fisher King and his fate. The Fisher King tells him he needs the ghosts to free him from his hibernation and his people to take over the planet. The Fisher King knows of the Timelords and mocks the Doctor. Back in the future the Ghosts are on the attack, whilst Clara and the remaining survivors find the hibernation chamber actually contains the Doctor. The Fisher King is lost as the dam is blown by the Doctor. Unfortunately the Ghosts are still that and UNIT is tasked to dispose of them in space where they will eventually disappear into nothing. The Doctor and Clara leave the three remaining survivors behind and set off on their next adventure. This episode was as dark and complex as the first part and gave enough thrills to keep you hooked from beginning to end. Once again I found it a hard episode for kids to understand but I am sure the ghosts would be enough to keep them entertained and hiding behind the sofa, especially the Fisher King, a horrendous-looking thing that would surely bring nightmares to kids and adults alike, although I think he was more like window dressing in this entire storyline as he was barely in it. The Ghosts are as creepy as can be with their eyeless faces and very strong characters for the Doctor Who universe who could easily come back in future episodes. Also, I have no idea why the Fisher King was so-called as it is not linked to Arthurian legend? Strong from start to finish, this episode once again showed that the Doctor was willing to make sacrifices if necessary, including his own for the greater good but as ever in Doctor Who not all is as it seems which can be a blessing and relief or an annoyance depending on where you are coming from as a viewer. This was yet again another very strong episode and the series is running along nicely. If you are interested in the above poster by the ever brilliant Stuart Manning (this is my favourite one yet) you can buy his prints and he does commissions too. You can view his work here and buy them here.